Israel’s ambassador to the United States, Ron Dermer, applauded President Trump’s decision to pull out of the United Nations Human Rights Council at a pride reception at the embassy in Washington, DC. The group has been at the forefront of fighting for LGBTQ rights worldwide. Michael Lavers, a reporter for the Washington Blade in attendance at the event, first reported the ambassador’s comments. An inside source who asked to remain anonymous said only a handful of people applauded Dermer’s comment but most attendees stayed silent as the ambassador praised Trump’s latest attack on human rights worldwide. The administration cited a “chronic bias against Israel” as the reason for pulling out of the UN group. The country is one of the few non-dictatorships Trump hasn’t attacked on social media and he enjoys a close relationship with Israeli Prime Minister Benjamin Netanyahu. “America has a proud legacy as a champion of human rights, a proud legacy as the world’s largest provider of humanitarian aid, and a proud legacy of liberating oppressed people and defeating tyranny throughout the world,” UN ambassador Nikki Haley said as she announced the US’s exit. The council has been a vociferous defender of LGBTQ rights around the world. The group has approved numerous resolutions supporting the human rights of LGBTQ people and in 2016 established the first independent expert tasked with investigating violence and discrimination based on sexual orientation and gender identity. Israel has had the dubious honor of being scrutinized regularly by the body for their treatment of Palestinians in Gaza and the Occupied Territories and has long criticized the council as too politicized and anti-Semitic. “The Trump-Pence administration’s decision to pull the U.S. out of the U.N. Human Rights Council is another failure of leadership when it comes to the human rights of LGBTQ people and other vulnerable populations,” said Ty Cobb, director of the Human Rights Campaign’s global department. 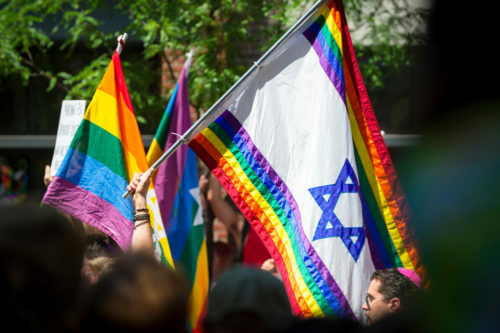 The Israeli government and activists are regularly accused of “pinkwashing” their human rights violations by highlighting their positive treatment of LGBTQ people in a notoriously hostile part of the world. Last night’s pride reception, however, was not the best place to attempt to praise a decision to abandon human rights. LGBTQ rights are human rights.